I roast or grill so many of my veggies now because, really, they are just so darn tasty! I like to vary up what I season or top them with and this one came out delicious! 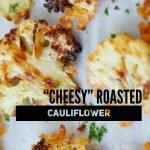 Remove from the oven and sprinkle the nutritional yeast and chopped parsley leaves on top of the cauliflower, roast again until the nutritional yeast is slightly crusty, about 5 minutes.